The Rome-based outfitter lets you choose from Ferraris, Lamborghinis, and Maseratis as well as less testosterone- fueled classics like the Fiat 500. 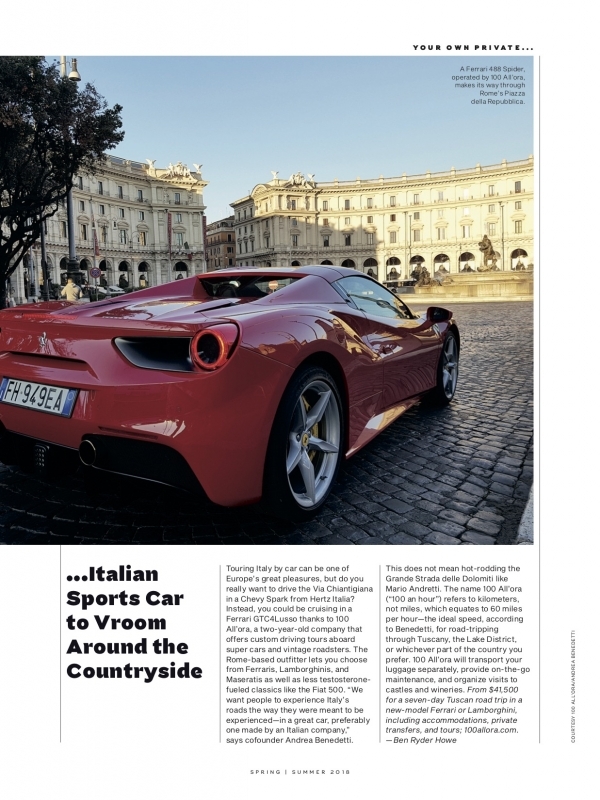 “We want people to experience Italy’s roads the way they were meant to be experienced—in a great car, preferably one made by an Italian company,” says cofounder Andrea Benedetti. This does not mean hot-rodding the Grande Strada delle Dolomiti like Mario Andretti. The name 100 All’ora (“100 an hour”) refers to kilometers, not miles, which equates to 60 miles per hour—the ideal speed, according to Benedetti, for road-tripping through Tuscany, the Lake District, or whichever part of the country you prefer.